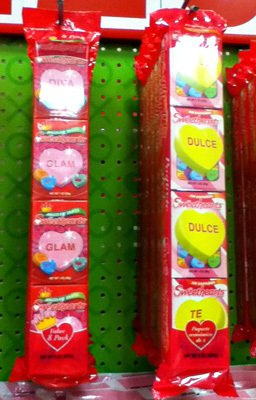 Target had tons of great choices for romantic candy, and almost all the options cost no more than $10. 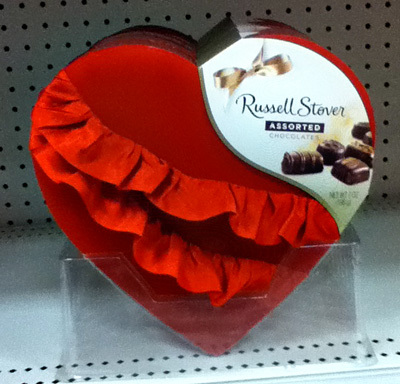 At the top of the page is a ruffly box of Russell Stover chocolates. If your gal is slightly girly and romantic, she’ll probably love this box! 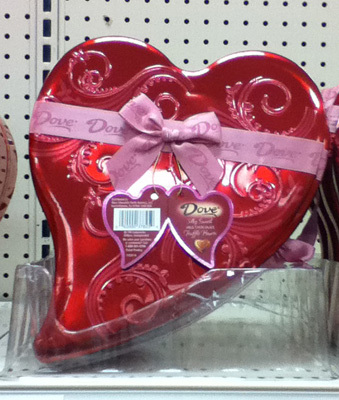 This box of Dove chocolates has a less-traditional shape, and is filled with delicious Dove chocolate hearts. If your sweetheart is a chocoholic, this will do the trick. 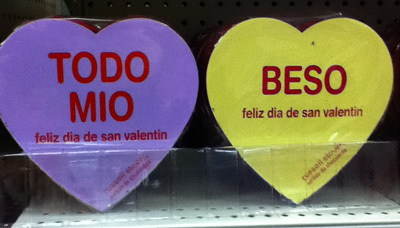 I like these boxes that look like candy hearts with messages in Spanish. They’re also filled with Russell Stover chocolates. Or, skip the heart-shaped box of bon-bons and get a candy rose. 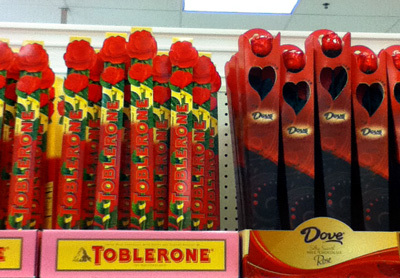 The Toblerone box is a standard Toblerone with a cardboard rose on the box, while the Dove box has a rose made of candy coming out the top. A tip from a lady to guys who need some help choosing a Valentine’s Day gift: this is a sweet gift, but because it’s smaller, make sure you tuck something else in with this one, like a gift certificate for a pedicure. There were several fun candy options to give to the manly men in your life! 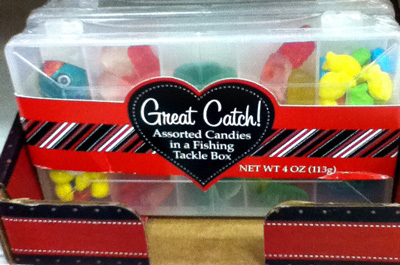 How about a candy tackle box? 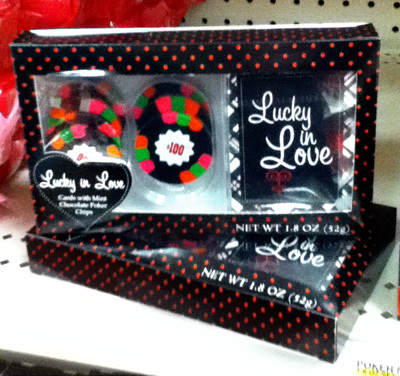 Or, if your man is a little more of a player, you could gamble on some Lucky in Love candy poker chips. 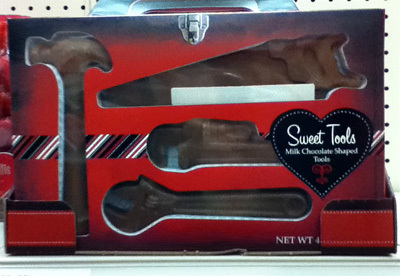 For your handy man, here are some milk chocolate tools. I might go back and get these for my construction-obsessed son. 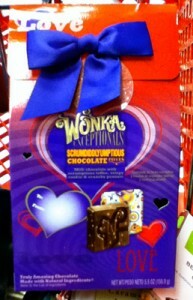 Target has some fun offerings for kid valentine candy. 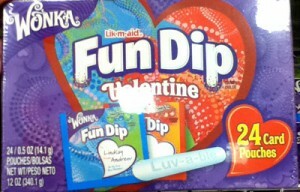 I would have loved to get these Fun Dip valentines from a classmate back in grade school! 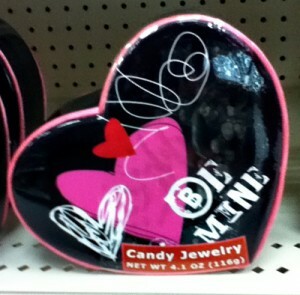 There are a couple different candy jewelry kits, which are perfect valentines for your little girl. No Valentine’s Day is complete without a few boxes of Sweethearts. Have you tried the Glam version? 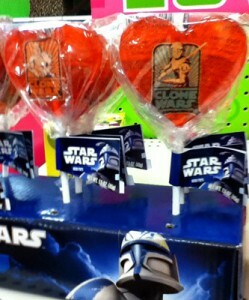 These Star Wars Clone Wars heart-shaped lollipops are so cool! Hearts + Star Wars = Love. 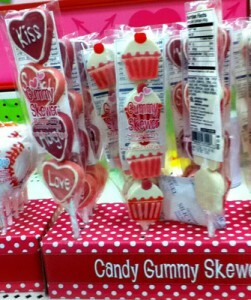 I think these gummy candy skewers are cute — especially the cupcakes! 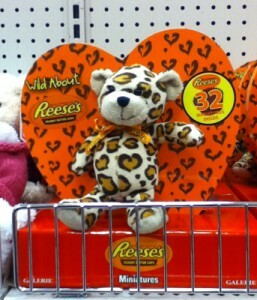 These heart-shaped boxes of Reese’s Peanut Butter Cups Miniatures come with a cute stuffed cheetah, which many kiddos would love. Or, if you want to give some special Valentine’s Day candy to a friend, co-worker, sibling, client, or someone who you don’t want to send the wrong message to, this would be a good choice. 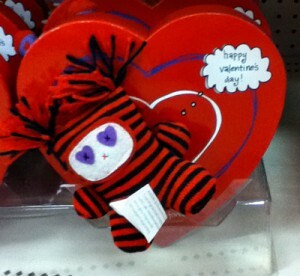 At first I thought this was a Valentine’s Day Voodoo doll, but when I looked at the tag, it said the toy was a “monster.” Hmm, a Valentine’s Day Monster, huh? Slightly creepy-cute, and completely perfect for your teen. I got this Wonka Scrumdiddlyumptious Chocolate for my family to try. How could you not? Don’t wait until Easter to get your Peeps fix! 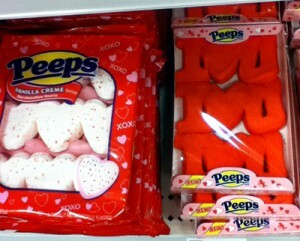 You can get marshmallow hearts and “I heart you” candy right now. I’m a huge fan of candy sprinkles. They make everything more fun! 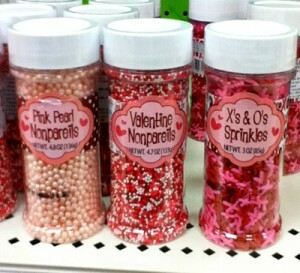 My favorite of this group are the pink pearl nonpareils (although, the X’s and O’s are pretty cool, too). If you are the baking type, make your own Valentine’s Day sweets, and add special sprinkles to make your goodies that much more fun. 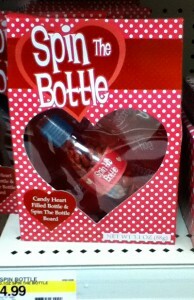 Slightly cheeky, this Spin the Bottle candy gift sends the message that you want to have a fun time with your sweetheart on Valentine’s Day. For some reason, you don’t see strawberries together with chocolate candy bars that often. 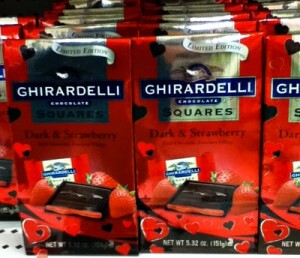 In fact, these Ghirardelli Dark & Strawberry squares might be the first ones that I’ve ever seen! This virtual tour of Target’s Valentine candy aisle should give you some inspiration about which sweet treat will be perfect for your valentine. Which of these candies caught your eye? What are you getting your sweetheart this year? Which candy do you want to receive?